Lipids, with their hydrophilic and hydrophobic properties, provide a potent toolbox for nanotechnology . They can be self-assembled into nano-films and other nano-structures, including micelles, reverse micelles, and liposomes . Lipid-protamine-DNA (LPD) complexes have been characterized for in vivo gene delivery with reporter plasmid constructs [2;3]. Our laboratory has shown that cell targeting and cell-specific peptides (homing peptides) integrated into LPD can increase the efficiency of gene delivery into mammalian cells [4;5]. In 2014, we demonstrated for the first time that nanoparticle-assisted targeted delivery of eye-specific genes significantly improved the vision of blind mice in vivo . One of the limitations of LPD is cell specificity . However, in our earlier study, LPD-mediated gene delivery successfully restored visual function in mice that lacked this function, as the delivered gene was only expressed in one type of retinal cell . If the same gene is expressed in multiple cell types, LPD-mediated gene delivery may have off-target effects. The retina is composed of seven different kinds of neural cells. Therefore, there is a need for cell-specific delivery of LPD nanoparticles. To demonstrate the significance and innovative nature of LPD in the retina, we first showed that cell-specific promoters enabled lipid-based nanoparticles to deliver genes to specific cells of the retina in vivo. 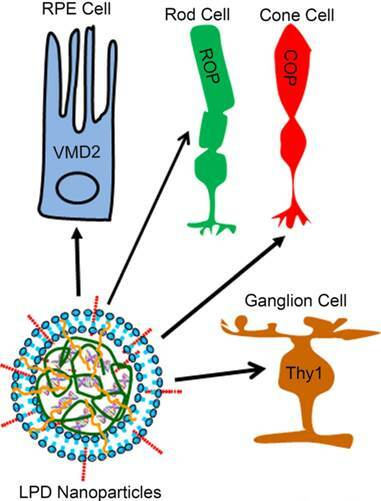 In the present study, we achieved retinal pigment epithelium cell specificity with vitelliform macular dystrophy (VMD2), rod cell specificity with mouse rhodopsin, cone cell specificity with red/green opsin, and ganglion cell specificity with thymocyte antigen promoters (Fig. 1). Retinal cell-specific delivery of genes. A liposome protamine/DNA lipoplex (LPD) integrated with a nuclear localization signal (NLS) peptide and transactivator of transcription (TAT) peptide was constructed for delivery of genes to retinal pigment epithelium (RPE) cells, rod cells, cone cells, and ganglion cells of the retina using cell-specific promoters. We achieved RPE cell specificity with vitelliform macular dystrophy (VMD2, 583 bp), rod cell specificity with mouse rhodopsin (225 bp), cone cell specificity with human red/green opsin (2100 bp), and ganglion cell specificity with thymocyte antigen (Thy1.2, 6500 bp) promoters. The lipids, 1,2-dioleoyl-3-trimethylammonium-propane (chloride salt; DOTAP), 1,2-dioleoyl-sn-glycero-3-phosphoethanolamine (DOPE), and cholesterol were obtained from Avanti Polar Lipids, Inc. (Alabaster, Alabama). The nuclear localization peptide (NLS, DKKKRKVDKKKRKVDKKKRKV) was procured from United Biosystems, Inc. (Herndon, Virginia). The TAT-peptide (YGRKKRRQRRR) was synthesized by Biosynthesis, Inc. (Lewisville, Texas). All animal work was performed in strict accordance with the Association for Research in Vision and Ophthalmology's statement on the “Use of Animals in Ophthalmic and Vision Research”. All protocols were approved by the Institutional Animal Care and Use Committee (IACUC) of the University of Oklahoma Health Sciences Center. Balb/c mice and Sprague-Dawley rats were purchased from Jackson Labs. All animals were maintained in our vivarium on cyclic light (5 lux; 12 h on/12 h off). Experiments were carried out with postnatal day 5 (P5) and 6-week-old male and female mice. We used a minimum of three and maximum of five animals in each experiment. We amplified GFP from pcDNA3-GFP-FKHR (Addgene # 9022) using sense (AAGCTT ACC ATG GTG AGC AAG GGC GAG GAG CTG) and antisense (GCGGCCGC GTA GTT GTA CTC CAG CTT GTG CCC CAG) primers and cloned it into pcDNA3 as a Hind III/Not1 fragment. The woodchuck hepatitis virus post-transcriptional regulatory element (WPRE) sequence [8;9] was cloned into pcDNA3 downstream of GFP as a Not1/XhoI fragment. It has previously been shown that the 0.5 kb region immediately 5' of the red pigment gene and the 1.6 kb fragment between 3.0 and 4.5 kb upstream of the red pigment gene are required for cone-specific expression . The human red-cone opsin promoter [10;11] containing the bases spanning -4564 to -3009 and -496 to 0 was amplified by PCR using primers. The -4564 to -3009 fragment was amplified with sense GTC GAC AGG CCT ACA GCA GCC AGG GTG AG and antisense GGATCC AAG AAT GTG AGA CCC AGA AGT GAG CC primers with 5' Stu1 and 3' BamHI sites. The -496 to 0 fragment was amplified with sense GGATCCGAT CCG GTT CCA GGC CTC GGC CCT AAA TAG and antisense GAATTCCATGGCTAT GGA AAG CCC TGT CCC CGC AGG primers with 5' BamHI and 3' EcoRI sites. The two PCR products were cloned into TOPO sequencing vector, and their sequence was verified. The two fragments were excised from the vectors with the respective restriction enzymes, and the two BamHI sites were ligated. The ligated 2.1 kb fragment was further amplified with sense TCG CGA AGG CCT ACA GCA GCC AGG GTG AG and antisense AGA TCT AAG CTT CATGGCTAT GGA AAG CCC TGT CCC CGC AGG primers with 5' Nru1 and 3' BglII and HindIII restriction sites. After sequence verification, the 2.1 kb red-cone opsin promoter (COP) was excised as Nru1 to BglII, which removes the CMV promoter fragment, and was cloned into pcDNA3 vector. The 225-bp mouse rod opsin (ROP) promoter was provided by Dr. Muayyad Al-Ubaidi, OUHSC. The RPE-specific VMD2 (vitelliform macular dystrophy) promoter construct VMD2-GFP construct was provided by Lea Bennett, OUSHC. The 6.3 kb human red/green opsin promoter construct was provided by Dr. Yun Z. Le, OUHSC. The Thy-1.2 promoter construct was a gift from Dr. Joshua Sanes (Addgene plasmid # 20736) . The LacZ and TAT-LacZ bacterial expression constructs were kindly provided by Dr. Steven Dowdy, UCSD. The pCAGEN vector (Addgene plasmid # 11160) was a gift from Dr. Connie Cepko . The cDNA encoding NeonGreen  (a kind gift from Dr. Martin-Paul Agbaga, OUSHC) was cloned into pCAGEN vector as EcoRI/Not1; this plasmid DNA was called CAG-NeonGreen. LPD was prepared according to the method reported previously , with some modification. First, the liposomes consisting of DOTAP (1, 2-dioleoyl-3-trimethylammonium-propane), DOPE (1, 2-dioleoyl-sn-glycero-3-phosphoethanolamine), and cholesterol (1:1:1 molar ratio; Avanti Polar Lipids, Inc., USA) were prepared by thin-film hydration. Second, protamine (1.25 mg/mL; Sigma-Aldrich Co. LLC, USA), peptides (NLS and TAT; 0.5 mg/mL), and the plasmid DNA (pDNA) were mixed at various weight ratios (Table 1). Using a 1:20 DNA to liposome ratio resulted in the best gene expression among all DNA to liposome ratios tested. The resultant protamine/pDNA complex was allowed to stand at room temperature for 20 min. The above liposome was then added into the protamine/pDNA complex, followed by vortexing. The resultant mixture was kept at room temperature for another 20 min to form liposome/ protamine/ DNA lipoplexes. For intravitreal injections, the animals were anesthetized with an intraperitoneal injection of ketamine (80-100 mg/kg) and xylazine (5 mg/kg). The eyes were injected with 1 µl (~ 85 ng of DNA) of LPD nanoparticles using a 33-gauge needle. Animals were monitored daily for signs of infection or cataracts, and were euthanized if either occurred. At the end of the experiment, the mice were killed and the eyes were processed for microscopic analysis. Formulation of lipid-based nanoparticles (LPD) for in vivo application. LPD was prepared according to the method reported previously . DOTAP, DOPE, and cholesterol (1:1:1 molar ratio) were prepared by thin-film hydration. Protamine (1.25 mg/m), peptides (NLS and TAT; 0.5 mg/mL) and the plasmid DNA (pDNA) were mixed at various weight ratios. Using a 1:20 DNA to liposome ratio resulted in the best gene expression among all DNA to liposome ratios tested. Intravitreal injection is ideal to target ganglion cells, but is not ideal to transduce genes to photoreceptor cells and retinal pigment epithelium. The subretinal injections were performed via the transscleral route. Mice were anesthetized by intramuscular injection of a ketamine (80-100 mg/kg) and xylazine (5 mg/kg) mixture of approximately 0.1 ml, until mice did not display a blink reflex to a touch on the corneal surface. Eyes were dilated with 1% cyclopentolate hydrochloride ophthalmic solution applied to the cornea (Akron, Lake Forest, IL). The mice were kept on a 37°C regulated heating pad under a surgical microscope (Carl Zeiss Surgical, NY). An insulin syringe with a beveled 30-gauge needle was used to puncture a hole in the cornea. Next, a 33-gauge blunt-end needle attached to a 10-μl Nanofil® syringe controlled by a UMP3 pump controller (World Precision Instruments, Sarasota, FL) was positioned toward the superior nasal portion of the retina. Then, 1 μl of LPD nanoparticles (~85 ng of DNA) were injected into the subretinal space. The needle was retracted 10-15 s after injection, when a bleb of retinal detachment was visible. Following complete removal of the injection needle, the eye was carefully observed for any indication of post-surgical complications, such as iris and sub-retinal bleeding, pronounced retinal detachment or damage, or excessive vitreous loss. After injection, saline and GelTeal lubricant eye gel (Alcon, Fort Worth, TX) were applied topically to the eye 3-4 times daily for 3-4 days after injection, to keep the eye continually moist. The severity of acute post-surgical complications and subsequent long-term complications, including eye infection, loss of visual function, and atrophy, were carefully evaluated to determine whether the animal would be excluded from the study. In the absence of any severe complications, the procedure was deemed successful and the animal remained in the study. E.coli BL21 (DE3) with the recombinant plasmid was grown to a stationary phase at 37°C in LB medium containing ampicillin (100 µg/ml) and a final concentration of 1 mM isopropyl β-D-galactopyranoside (IPTG). The bacteria were harvested by centrifugation at 10,000 x g for 10 min. The bacteria were suspended in buffer A (50 mM Tris-HCl, pH 8.0 containing 100 µg/ml lysozyme, 2 mM EDTA, 1 mM phenylmethylsufonyl fluoride, 0.5 µg/ml leupeptin, 0.1% Triton X-100, 10 mM MgCl2, and 10 µg/ml DNase). The bacterial suspension was incubated for 30 min on ice. The lysate was cleared by centrifugation at 15,000 x g for 20 min. The pellet was discarded. The supernatant was loaded onto a Ni2+-NTA agarose (super flow) affinity column equilibrated with 10 mM imidazole. This was followed by elution with 500 mM imidazole. The morphology of LPD was observed using TEM (Carl Zeiss, Germany). One drop of LPD or LPD complexed with TAT peptide was placed on a copper grid. The samples were negatively stained with 1% uranyl acetate. The grid was allowed to dry further for 20 min and was then examined with the electron microscope, as we described previously . Mice were anesthetized with an intraperitoneal injection of ketamine (80-100 mg/kg) and xylazine (5 mg/kg) to prevent large movements during the fundoscopy (Micron III fundoscope). Both pupils were dilated using a topically applied drop of tropicamide (1%) to neutralize corneal optical power and focus the fundoscope onto the retina. Hydroxymethylcellulose ophthalmic demulcent solution (Goniosol 2.5%) was placed on the cornea to preserve corneal hydration and to couple the objective to the cornea. Mice were secured on a custom stage that allowed for free rotation, in order to align the eye for imaging of the optic nerve head. Images were taken using Bright field or GFP filters. Images were further processed in Adobe Photoshop CS5. Eyes were enucleated and placed in cold Hanks' Balanced Salt Solution buffered with 25 mM HEPES (pH 7.2), after which the cornea and lens were removed and the retina and RPE were carefully isolated. Relaxing cuts were made in the retinal margins. The whole retinas or RPE were flattened onto a black filter membrane. Whole-mounted retinas were fixed in 4% paraformaldehyde in PBS at 4ºC for 2 h, and were rinsed in PBS. Intrinsic fluorescence or labeling in retinal and RPE whole-mounts was imaged using either a Nikon Eclipse E800 (Tokyo, Japan), an Olympus IX70, or an Olympus MVX10 (Olympus USA, Center Valley, Pennsylvania) microscope. Timed pregnant Sprague-Dawley® rats were ordered each week. The retinas of 10-15 0-to-2-day-old pups were removed with a dissecting microscope under sterile conditions in a tissue culture hood. The retinas were suspended in 25 ml of Dulbecco's Modified Eagle's Medium (DMEM) with F-12 medium plus 10% fetal calf serum in a plastic bag, and were mechanically dissociated for 2 min using a Stomacher set on low power. The suspension was first filtered through a 230-μm sieve, which was then rinsed once with medium. The combined filtrates were passed through a 140-μm sieve, followed by a rinse with undiluted fetal calf serum. The filtered suspension was centrifuged at 800 rpm for 5 min in a clinical centrifuge. The supernatant was decanted, and the cell pellets were resuspended in 25 ml of media using a sterile 5-ml pipette. Cell concentration was determined with a cell counter or hemocytometer. The suspension was diluted with medium to 1 × 105 cells/ml. The cells (1 ml) were plated in 24-well tissue culture plates on 12-mm coverslips that had been pretreated overnight with 10 μg/ml poly-d-lysine. The cells were maintained in DMEM with F-12 medium and 2% fetal calf serum, or in synthetic serum-free media. The cultures were used in experiments 7-10 days after plating. The cDNA open reading frame of LacZ (β-galactosidase) was cloned in-frame downstream of an N-terminal leader composed of a six-histidine-residue purification tag, followed by the presence or absence of TAT-PTD sequence (YGRKKRRQRRR; Fig. 2A). The recombinant proteins were expressed in bacteria and purified to apparent homogeneity on a Ni2+-NTA chromatography column (Fig. 2B). To determine the transduction efficiency of TAT-PTD, we prepared primary retinal neurons from rat retinas, and incubated these with purified TAT-LacZ or LacZ proteins for 30 min. The cells were then washed with PBS. LacZ enzyme activity was assessed by X-Gal staining . The neurons treated with TAT-LacZ showed strong LacZ activity, while neurons treated with LacZ lacking TAT-PTD did not (Fig. 2C,D). This finding suggests that the TAT-PTD sequence efficiently transduced the proteins in vitro. The absence of LacZ activity in LacZ-treated neurons was not due to enzyme inactivation, but was caused by lack of internalization, as both purified LacZ and TAT-LacZ had similar enzyme activity in vitro (Fig. 2E). The morphology of LPD and LPD complexed with TAT peptide was observed using TEM. The sizes of the LPD and LPD complexed with TAT peptide ranged from 80-120 nm (Fig. 3). The results show that addition of TAT peptide did not change the size or morphology of LPD. We examined the efficacy of lipid nanoparticles in the delivery of GFP plasmid DNA to the retina. We complexed LPD, with or without TAT or NLS peptides (Fig. 4). Control experiments were done with liposome and protamine without plasmid DNA. Four-week-old Balb/c mice were subretinally injected with LPD nanoparticles with the above combinations. GFP fluorescence was examined two and seven weeks later using fundoscopy to visualize the interior surface of the eye. Our results clearly suggest that LPD combined with NLS enhances the expression of GFP; in combination with TAT, the expression is even stronger (Fig. 4). Interestingly, at seven weeks after injection, the GFP expression was much stronger than it was at two weeks after injection, suggesting that LPD facilitates longer sustainability of gene expression. Effect of TAT-epitope on the internalization of proteins. Schematic illustration of LacZ and TAT-LacZ plasmid DNAs used in this study (A). Proteins were expressed in the bacteria, and affinity purified on a Ni2+-NTA super flow affinity column chromatograph. Various fractions of the column (lysate, unbound, wash, and eluted fractions) were subjected to SDS-PAGE, followed by Coomassie blue staining to visualize the proteins (B). 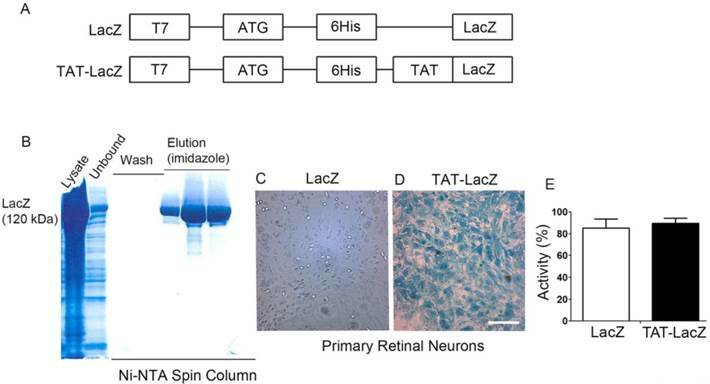 Transduction of LacZ and TAT-LacZ proteins into the retinal primary neurons in culture. Analysis of LacZ enzyme activity assays by X-Gal staining after 30 min of incubation (C,D). Scale bar: 200 µm. To determine the effect of TAT on LacZ activity, equal amounts of (63 ng) TAT-LacZ and LacZ proteins were used to measure LacZ activity (E). Morphology of LPD observed with transmission electron microscopy (TEM). The LPD (A) and LPD complexed with TAT peptide (B) were negatively stained with 1% uranyl acetate and visualized under TEM. Scale Bar: 100 nm. Effect of TAT on the in vivo transfection by LPD. Plasmid DNAs of either control plasmid (LPD with pcDNA3 vector) or GFP were complexed with LPD in the presence or absence of TAT or NLS, or a combination of TAT and NLS, and injected subretinally into Balb/c mice. Fluorescent fundoscopy images of the eye were taken two and seven weeks after injection. Scale bar: 100 µm. To determine the RPE cell-specific expression of LPD in vivo, we used RPE (Vitelliform macular dystrophy, VMD2) cell-specific promoter. Plasmid DNAs of pcDNA3 (control) or VMD2-GFP were individually complexed with LPD and subretinally injected into Balb/c mice. One week later, fundoscopy was performed on the mice. Mouse eyes were harvested and subjected to RPE and retinal flat mount preparation. RPE and retinal flat mounts were then examined for GFP expression. GFP expression was observed in RPE, but was barely detectable in the retina (Fig. 5A and B). Retinal pigment epithelium protein 65 (Rpe65) is an RPE-specific protein . We stained both RPE and retinal flat mounts with Rpe65 antibody. 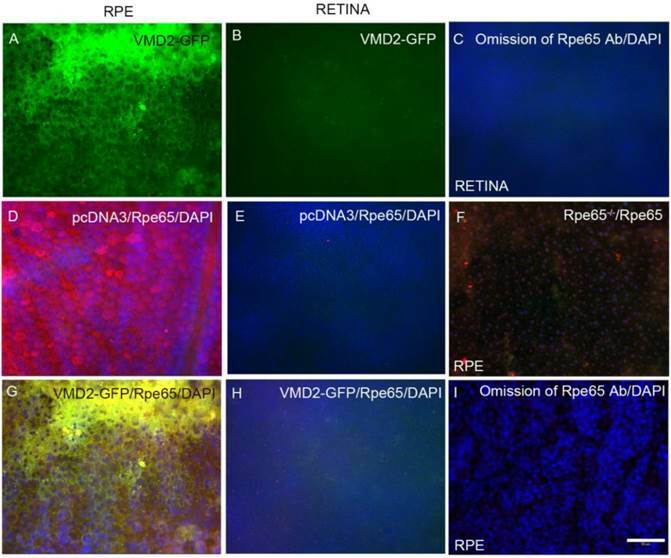 We observed Rpe65 expression in RPE, while Rpe65 was barely detectable in the retina (Fig. 5D and E). To examine the specificity of Rpe65 antibody towards Rpe65 protein, we stained RPE flat mounts prepared from Rpe65-/- mice. The results showed a complete absence of Rpe65 expression in RPE from Rpe65-/- mice (Fig. 5F). When we merged the images of GFP and Rpe65, the merged images indicate a co-localization of VMD2-GFP with Rpe65 protein in the RPE (Fig. 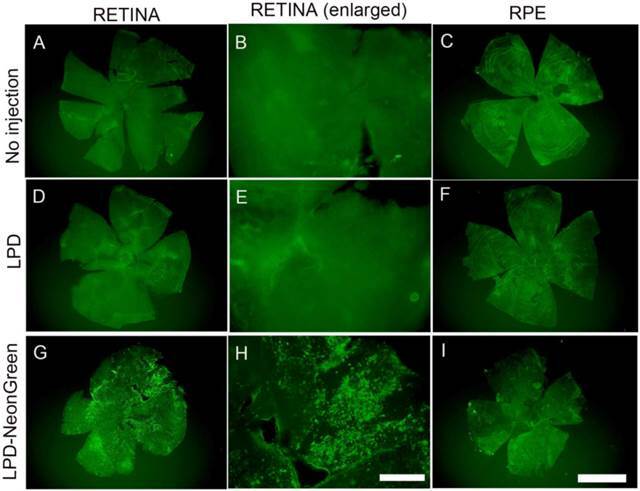 5G) and the absence of GFP and Rpe65 expression in the retina (Fig. 5H). These findings suggest an LPD-mediated RPE cell-specific expression of GFP under the control of RPE cell-specific promoter. To achieve rod and cone cell-specific expression, we cloned GFP under the control of mouse rod opsin promoter (ROP). To achieve cone cell-specific expression, we cloned GFP under the control of human red/green cone opsin promoter (COP). Plasmid DNAs of pcDNA3 (control), ROP-GFP, and COP-GFP were individually complexed with LPD and subretinally injected into Balb/c mice. We previously reported that CMV-promoter drives reporter gene expression in the RPE, and we used this construct as a positive control . One week later, fundoscopy was performed on the mice. 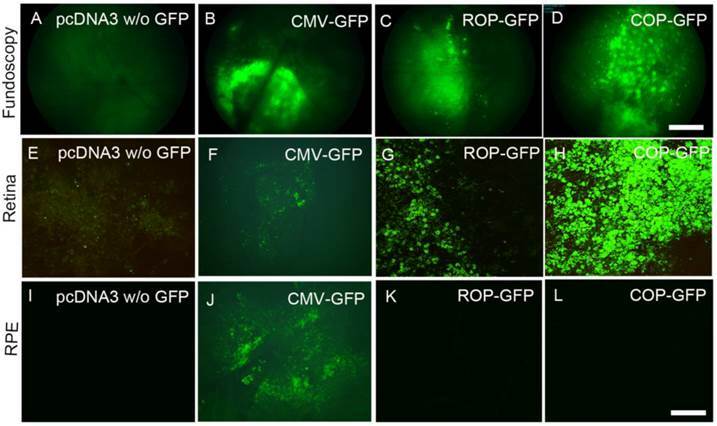 The results revealed the expression of GFP in CMV-GFP-, ROP-GFP-, and COP-GFP-injected mice, but no GFP expression in pcDNA3 control mice (Fig. 6A-D). Analysis of GFP expression on retinal and RPE flat mounts indicated that ROP and COP drive the expression of GFP in the retina (Fig. 6 G, H), but not in the RPE (Fig. 6 K, L). However, the CMV-promoter drives increased expression of GFP in the RPE (Fig. 6J) compared with the retina (Fig. 6F). These experiments suggest an LPD-mediated rod and cone cell-specific expression of GFP under the control of rod and cone cell-specific promoters. 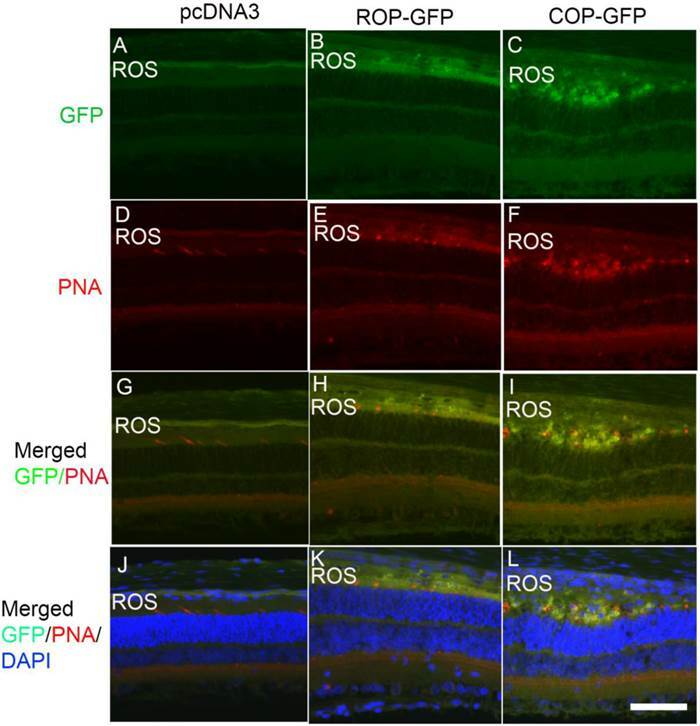 To determine the cell-specific expression of GFP in rod and cone cells, we labeled prefer-fixed retinal sections of pcDNA3, ROP-GFP, and COP-GFP with cone-specific marker peanut agglutinin (PNA), which labels cone outer segments, and examined the sections for fluorescence. We observed no GFP fluorescence in pcDNA3-injected mouse retinas, but observed PNA staining in the cones (Fig.7A,D). Both ROP-GFP- and COP-GFP-injected mouse retinal sections expressed GFP fluorescence (Fig. 7B,C). However, PNA co-labeled with GFP in cones (Fig. 7I), but not in rods (Fig. 7H). Collectively, these data show that LPD efficiently delivers genes in a cell-specific manner under the control of cell-specific promoters. LPD-mediated retinal cell-specific expression by Rpe-specific VMD2 promoter. Plasmid DNAs of either control (pcDNA3 vector) or vector carrying GFP under the control of VMD2 were complexed with LPD and subretinally injected into Balb/c mice. One week later, RPE (A, D, G, F, I) or retinal (B, C, E, H) flat mounts were prepared and examined under microscopy for fluorescence or stained with Rpe65 antibody (D, E, F, G). Scale bar: 50 µm. Panel F represents the RPE flat mount from Rpe65-/- mice stained with Rpe65 antibody (control for Rpe65 expression). LPD-mediated retinal cell-specific expression by rod cell-specific mouse rhodopsin promoter (ROP) and cone cell-specific cone-opsin promoter (COP). Plasmid DNAs of either control (pcDNA3 vector) or vector carrying GFP under the control of CMV, ROP, or COP were individually complexed with LPD and subretinally injected into Balb/c mice. One week later, fluorescent fundoscopy images of the eye were taken (A-D), followed by retinal (E-H) or RPE flat mounts (I-L) that were prepared and examined under microscopy for fluorescence. We included CMV-GFP (B, F, J) as a positive control, since CMV-promoter drives the expression in RPE (J) compared with the retina (F). Panels A, E, I represent the LPD-mediated transfection of pcDNA vector without (w/o) carrying GFP. Scale bar: A-D, 100 μm; E-L, 50 µm. Analysis of LPD-mediated photoreceptor cell-specific gene expression. We incubated prefer-fixed sections of LPD-pcDNA3- (A, D, G, J), LPD-pcDNA3-ROP-GFP- (B, E, H, K), and LPD-pcDNA3-COP-GFP- (C, F, I, L) injected eyes from Balb/c mice with peanut-agglutinin (PNA), which labels the cone outer segments, and examined the GFP fluorescence under fluorescence microscopy. Panels A-C represent GFP fluorescence; panels D-F represent PNA labeling of cones; panels G-I represent co-labeling of GFP/PNA, and panels J-L represent co-labeling of GFP/PNA and DAPI to visualize nuclei. ROS, rod outer segments. Scale bar: 50 µm. We constructed a gene delivery vector specifically targeting retinal ganglion cells (RGCs). The promoter contains 6.5 kb of the murine Thy-1.2 gene, extending from the promoter to the intron following exon 4, but lacking exon 3 and its flanking introns. The deleted sequences are required for expression in non-neural cells, but not in neurons, whereas sequences in upstream introns are required for expression in neurons (Fig. 8A). We cloned the GFP sequence into an Xho1 site, replacing the deleted sequences. We transfected the Thy1.2-GFP construct into HEK-293T cells, and intravitreously injected the construct complexed with LPD into Balb/c mice. Seventy-two hours later, GFP fluorescence was examined in HEK-293T cells and retinal flat mounts. We co-labelled RGCs with Brn-3a, a ganglion cell marker. We observed no expression of GFP driven by Thy-1.2 promoter in HEK-293T cells (Fig. 8 B-D). 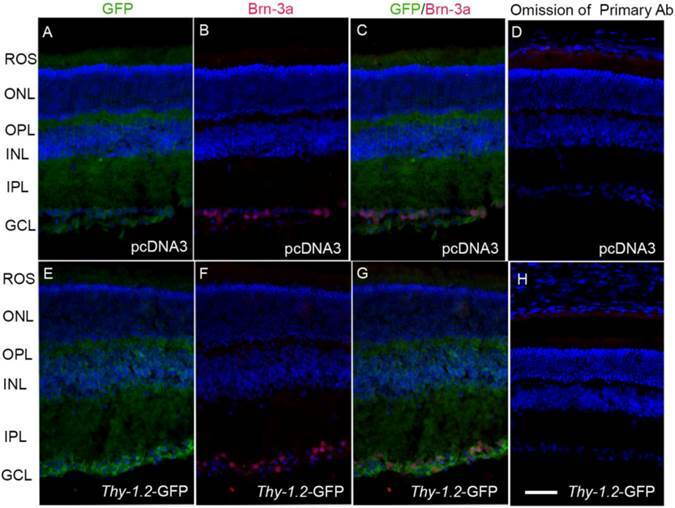 However, GFP driven by Thy-1.2 promoter was expressed in RGCs and was co-localized with Brn-3a on retinal flat mounts (Fig. 8. H-K). To specifically determine the ganglion cell-specific expression of GFP, we labeled cryosections of pcDNA3 and Thy1.2-GFP sections with Brn-3a (Fig. 9B and F), and examined the sections for fluorescence (Fig. 9A and E). We observed no GFP fluorescence in pcDNA3-injected mouse retinas (Fig. 9A), but observed fluorescence in the ganglion cell layer (Fig. 9E). The Brn-3a expression co-localizes with GFP in the ganglion cell layer (Fig. 9G). Collectively, these data show that LPD under the control of a ganglion cell-specific promoter efficiently delivers genes to ganglion cells. We cloned a cDNA encoding NeonGreen fluorescent protein under the control of a CAG promoter. CAG promoter contains a cytomegalovirus (CMV) early enhancer element, the promoter, the first exon and the first intron of chicken beta-actin gene, and the splice acceptor of the rabbit beta-globin gene [18;19]. The NeonGreen plasmid DNA was complexed with LPD and injected subretinally into mice. One week later, retina and RPE flat mounts were prepared and NeonGreen fluorescence was examined. The results indicate a high level of expression of NeonGreen in the retina, but not in the RPE (Fig. 10G-I). LPD-mediated gene delivery to retinal ganglion cells. Schematic representation of the Thy-1.2-driven GFP expression cassette. The promoter contains 6.5 kb of the murine Thy1.2 gene. Exon 3 is required for expression in non-neural cells, but not in neurons. We cloned the GFP sequence into an Xho1 site, replacing exon 3. Exons 1 through 4 are shown in the diagram (A). Expression of GFP driven by CMV and Thy-1.2 promoters in HEK-293T cells. 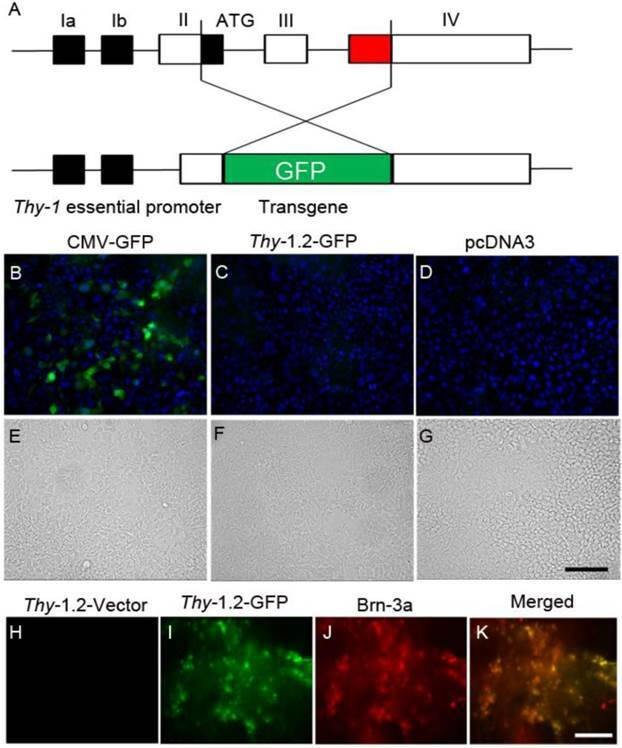 Expression constructs of GFP driven by CMV (B) and Thy-1.2 (C) promoters were transfected into HEK-293T mammalian cells. CMV-pcDNA3 plasmid (D) was used as a negative control. Cells were examined for fluorescence 72 h after transfection. DAPI was added to cells to visualize nuclei (blue). Panel E-G represents bright-field light images of B-D. Plasmid DNAs of either Thy-1.2 vector or Thy-1.2- GFP were complexed with LPD and injected intravitreously into Balb/c mice. One week later, retinal flat mounts were prepared and examined for GFP expression (H, I), or co-labelled with a ganglion cell maker, Brn-3a (J). Panel K represents a merged image of GFP and Brn-3A. Scale bar: 50 μm. Analysis of LPD-mediated ganglion cell-specific gene expression. We incubated prefer-fixed sections of LPD-pcDNA3- (A-D) or LPD-Thy1.2-GFP- (E-H) injected eyes from Balb/c mice and stained the sections with Brn-3a and GFP antibodies. Panels A and E represent GFP fluorescence; panels B and F represent Brn-3a labeling of ganglion cells; panels C and G represent merge images of GFP and Brn-3a; panels D and H represent the omission of primary antibodies. Nuclei were stained with DAPI. Scale bar: 50 µm. ROS, rod outer segments; ONL, outer nuclear layer; OPL, outer plexiform layer; INL, inner nuclear layer; IPL, inner plexiform layer; GCL, ganglion cell layer. LPD-mediated gene delivery under the control of CAG promoter. NeonGreen plasmid under the control of CAG promoter was complexed with LPD and injected subretinally into Balb/c mice. Controls include no injection and LPD without NeonGreen. One week later, retinal (A, D, G) and RPE (C, F, I) flat mounts were prepared. We examined fluorescence as a function of NeonGreen expression. A region of the retinal flat mount was enlarged (B, E, H). Scale bar: A, C, D, F, G, I: 1 mm; B, E, H: 200 µm. Effect of LPD on retinal structure. 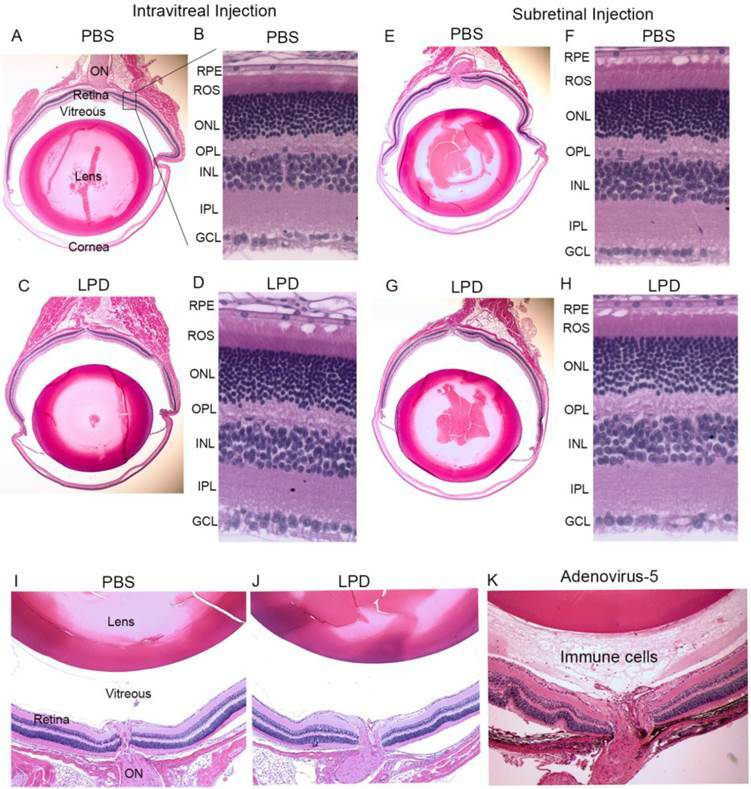 To examine whether LPD has a deleterious effect on retina structure, PBS or LPD was injected into Balb/c mice intravitreally (A, B, C, D) or subretinally (E, F, G, H). Five-micrometer-thick sections of retinas were cut along the vertical meridian and stained with hematoxylin and eosin (A, C, E, G). A region of the retina near the optic nerve head was enlarged for fine details (B, D, F, H). A region around the optic nerve head was imaged to examine for any immune cells. Panel I represents the intravitreally PBS-injected eye, and panel J represents the intravitreally LPD-injected eye. Mouse eyes injected with Adenovirus 5 (Ad5) were used as a positive control for inflammation. Immune cells were observed in the vitreous of the Ad5-injected eye (K). RPE, retinal pigment epithelium; ROS, rod outer segments; ONL, outer nuclear layer; OPL, outer plexiform layer; INL, inner nuclear layer; IPL, inner plexiform layer; GCL, ganglion cell layer. To examine whether LPD has a deleterious effect on retinal structure, PBS or LPD was subretinally or intravitreally injected into Balb/c mice. One week after injection, mice underwent electroretinography (ERG). After ERG, mice were killed with an overdose of carbon dioxide. Five-micrometer-thick sections of retinas were cut along the vertical meridian and stained with hematoxylin and eosin to permit examination of the retina (Fig. 11). A region of the retina near the optic nerve head was enlarged for fine details (Fig. 11A). The results showed that there was no difference in the morphology of the retina after PBS and LPD injection, and no difference after either subretinal or intravitreal injection (Fig. 11B,D,F,H). The results also suggested that there was no inflammation in the vitreous cavity in either PBS- or LPD-injected eyes (Fig. 11 A, E, C, G). For positive control of inflammation, we intravitreally injected adenovirus 5, and we found the presence of immune cells in the vitreous cavity (Fig. 11K). Our current work represents the promising application of biocompatible lipid-based non-viral nanoparticles to achieve eye cell type-specific gene transfer to develop gene therapy strategies for treating blinding eye diseases. As a proof of principle, the LPD complexed with genes under the control of retinal cell-specific promoters produced cell-specific expression of the reporter gene. The formulated lipid nanoparticles may be appropriate for use with other tissues, for the purposes of gene delivery with tissue-specific promoters. In the present study, we did not compare our approach with surface-engineered viral vectors . However, our previous publications reported that Rpe65 gene delivery to Rpe65 knockout mice is comparable to AAV  and lentiviral  gene transfer of Rpe65 to Rpe65 knockout mice. Despite the promise associated with the use of viral vectors in gene therapy, there are also significant risks. These risks include the possibility that a virus may recover its ability to cause disease once inside the body and the possibility of immune and inflammatory responses whenever any foreign particle, such as a virus, is introduced into the body. We have not observed any inflammatory response in response to LPD administration to the eye. We found that LPD has no effect on the retinal structure (Fig. 11) or visual function (data not shown), consistent with our earlier findings that subretinal injection of LPD nanoparticles with target genes significantly rescued the visual function in blind mice . The advantages are that LPD nanoparticles are biocompatible and the particles are stable, as demonstrated indirectly by gene expression, in addition to long-term expression of the gene by a single administration. LPD demonstrates much lower gene expression than does viral-mediated gene delivery. This may be a limitation. However, this lower level of expression did not affect the rescue of retinal function in Rpe65 gene delivery . We generally administer 1-1.5 μl of LPD nanoparticles, which contains ~85 ng of DNA, per eye. Further studies should aim to increase the amount of DNA to boost gene expression. However, overexpression of genes to photoreceptors may cause retinal degeneration . In the current study, we showed RPE and retinal cell expression by a ubiquitous CMV promoter. Surprisingly, the same promoter in the CAG vector , drives the expression of the reporter gene only in the retina but not in the RPE (Fig. 10). This deviation from its ubiquitous nature could be attributable by the presence of a human beta-globin intron in the CAG vector (Fig. 10) and is absent from the CMV-GFP vector (Fig. 6). In a recent study, CMV vector carrying the human beta-globin intron was used to target anti-oxidant genes to photoreceptor cells . Intravitreal injection is ideal to target ganglion cells, but transfection of different retinal cells has been achieved after both types of administrations, subretinal and intravitreal. Generally, intravitreal administration of genes driven by a ubiquitous promoter should be able to diffuse to the retina. Therefore, the intravitreal administration could be an advantage over subretinal injection . Since the efficiency of LPD is lower than the viral mediated approach, subretinal injection would be an ideal route for LPD-mediated RPE and photoreceptor cell expression. In the present study, we also cloned the woodchuck hepatitis virus post-transcriptional regulatory element (WPRE) sequence [8;9] downstream of GFP, which is known to increase the gene expression. Cell-targeting and cell-internalization peptides have been extensively used for efficient drug delivery and for image analysis [4;5]. A peptide derived from TAT-protein from human immunodeficiency virus (HIV)-1, has been utilized to deliver exogenous proteins that translocate through the cell membranes and accumulate in the nucleus . These protein transduction domains have been extensively used for the delivery of biologically active proteins in vivo [26-28] , and protein therapy has been used as a treatment for various diseases [29-31]. In the present study, we found that TAT peptide enhanced LPD-mediated gene delivery in vivo. The current study has significantly contributed to findings regarding the therapeutic potential of this approach for treating a variety of retinal degenerative diseases. Among these, age-related macular degeneration (AMD) is an eye disease primarily affecting the central vision in people ages 60 and older [32;33]. In AMD, light-sensing rod and cone photoreceptor cells do not function over time [32;33]. Age and disease-related structural changes in the RPE have been reported in AMD [34;35]. Retinitis pigmentosa (RP) is the most common inherited cause of blindness in people between the ages of 20 and 60 worldwide . In RP, rods are affected, followed by cone photoreceptors . Diabetic retinopathy (DR) is the most common disorder affecting cones [38;39]. Retinal ganglion cell (RGC) survival is critical for vision, and injury to RGC axons in the optic nerve may lead to rapid RGC death [40;41]. Progressive RGC cell death is known to occur in optic neuropathy, optic neuritis, and glaucoma [40;41]. In the present study, we tested the LPD-mediated delivery of genes to RPE cells, rod cells, cone cells, and ganglion cells. This work will help in targeting therapeutic genes in the retinal diseases described above. Our studies clearly show that LPD could be used to deliver a functional gene to the retina. To demonstrate cell specificity to circumvent off-target effects in the future, we achieved retinal pigment epithelium, rod, cone, and ganglion cell-specific expression with retinal cell-specific promoters. This work will inspire investigators in the field of lipid nanotechnology to couple cell-specific promoters to drive expression in a cell- and tissue-specific manner. Our study demonstrated for the first time that cell-specific promoters could enable lipid-based nanoparticles to deliver genes to specific cells of the retina in vivo. LPD, lipid nanoparticles; CMV, cytomegalovirus; RP, retinitis pigmentosa; RPE, retinal pigment epithelium. This study was supported by grants from the National Institutes of Health (EY016507, EY00871, and NEI Core grant EY021725), bridge funding from the Presbyterian Health Foundation, and an unrestricted departmental grant from Research to Prevent Blindness, Inc. BC and CBM would like to thank the financial support from National Institutes of Health (CA200504, CA195607, and EB021339), National Science Foundation (CMMI-1234957 and CBET-1512664), Department of Defense Office of Congressionally Directed Medical Research Programs (W81XWH-15-1-0180), Oklahoma Center for Adult Stem Cell Research (434003), and Oklahoma Center for the Advancement of Science and Technology (HR14-160). The authors thank Dr. Wei Cao (deceased) for his help in preparing primary retinal neurons. The technical help of Ms. Garima Thapa is highly appreciated. The authors acknowledge Ms. Kathy J. Kyler, Staff Editor, University of Oklahoma Health Sciences Center, for editing this manuscript. The authors claim no competing financial interests. Corresponding authors: Email: raju-rajalaedu; cbmaoedu.